M48 OPS Series for sale are made by United Cutlery. 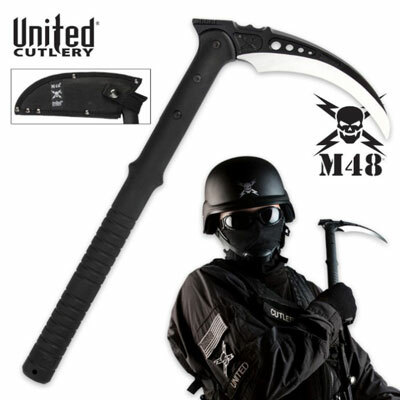 Shop and buy from a large selection of unique blades and tools from M48 Ops. Items include modern survival knives, axes, tomahawks, survival spears, machetes, bowie knives, harpoons and more. M48 Tactical Kama is from the lightweight and functional series.The M48 Tactical Kama measures 15 ½ inches in all. They have a sharpened 8 ¼ inch, precision cast 2Cr13 stainless steel head with a 5 ¼ inch blade. The M48 Tactical Kama features the traditional design of a Japanese or Filipino Kama. However, the sharpened blade and M48 construction make the Tactical Kama better suited for karate and Chinese Martial Arts. They have a sturdy nylon reinforced fiberglass handle with a textured grip. They also include a reinforced nylon M48 blade sheath.